Dress Designers State: "The bust should be halfway between your shoulder and elbow." If you measured 12" from shoulder to elbow . . . halfway is 6"
and the elbow. If the bust is lower than the darts and tucks, clothing doesnt fit properly. With Bras Galore and More, you get a personal consultation at no additional charge. We will help you find healthy support, a proper fit, give you a great silhouette and comfort. ~ Your breasts have no muscle tissue. ~ When gravity pulls your breasts down, it also stretched your delicate neck and face tissue. 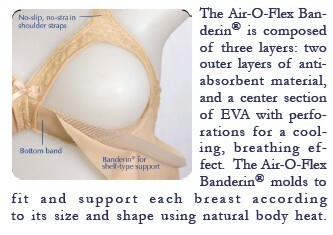 ~ Your breasts depend on an outside source of support to keep proper shape. ~ The shape of your breasts is determined by the bras you wear. ~ Most bras on the market today are only covers. ~ Your breasts must be lifted to allow proper circulation. ~ Without proper support, lymphatic drainage is impeded, which interferes with health. ~ Breast disease is more likely when there is no circulation and no lymphatic drainage. Beauty for You....LeUnique....formally Jeunique.....same great products, but with a new name! Read our recent article in The Post by clicking here, entitled "Bras Can Be Your Breast Friend"
The cost of our bras run from $99 to $139 depending on size. Our bras will outlast conventional bras 3 to 1. Purchasing a LeUnique Custom Fit Bra will not only provide you with comfort and support, but is also an investment in your breast health. Beauty for You LeUnique, formally Jeunique. Same great bras offered with added benefits and new styles. On average a woman purchases 5 bras per year at $35 to $75 or more each. This means a minimum of $165 in one year or $330 or more in two years; after 3 or 4 months of wear and laundering most regular bras lose their shape and what little support they provided. Most bras give out - not wear out! Isn't it time you had a better made bra? Click to read our article, published January 2013 in the Hanover Post.